But these are only some of the most obviously challenging aphorisms contained in this volume. The more insidious ones are like time-bombs or retroviruses: I rarely “get” them the first time I read them. Don’t even necessarily get them when I’m reading them. Instead, something happens or someone says something, days or even weeks later, and a bell goes off in my head and I think “a-ha”—that’s what he meant! For instance, this aphorism (which I posted the other day on Facebook) is loved at first for almost all of the wrong reasons: “If it has never crossed your mind that you might be stupid, you are.” People who’ve been (like me), at times, painfully aware of their inadequacy, read this and feel smart. Until, that is, they realize, a few days or weeks later, that although failing the aphorism’s test proves that you’re stupid, passing it doesn’t prove that you’re smart. A week or two later, however, it gets worse: the self-congratulatory glow loses all of what’s left of its luster when you realize that you can be stupid and know you’re stupid. I read a great deal (probably more than I should), and I’ve been a great lover of the aphoristic genre for over twenty years. 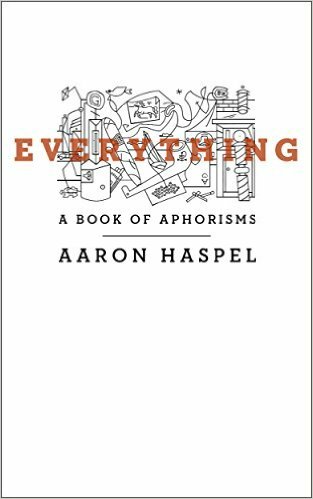 Yet never before have I encountered so many aphorisms written by a contemporary of such a high quality: Haspel is in a league of his own. At his best, Nassim Nicholas Taleb’s aphorisms in The Bed of Procrustes (2010) rival those of Epicurus (e.g., “Love without sacrifice is like theft” is something I wish I had written). But my fellow Canadian, George Murray, probably deserves the prize for second place. His most recent collection of aphorisms, Glimpse (2010), is often outstanding (e.g., “Rubble becomes ruin when the tourists arrive”). Even so, the collection is scandalously uneven, and it really doesn’t hold a candle to Everything. To wit: Aaron Haspel is the greatest master of the aphoristic form writing in English today. It’s always hard to know which books will stand the test of time, which books will be read 300 years from now. But if I was a betting man, I’d bet on Everything. Next Next post: Alabama, Goddamn!